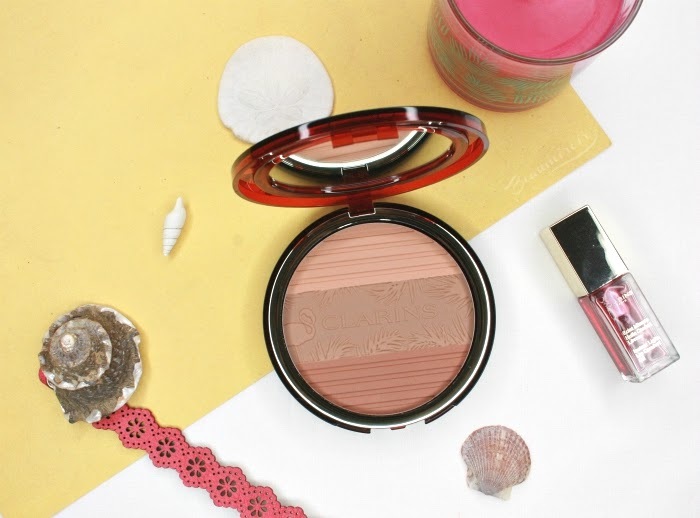 Here comes the last installment of our Summer 2018 New Bronzers By Top French Beauty Brands post series! 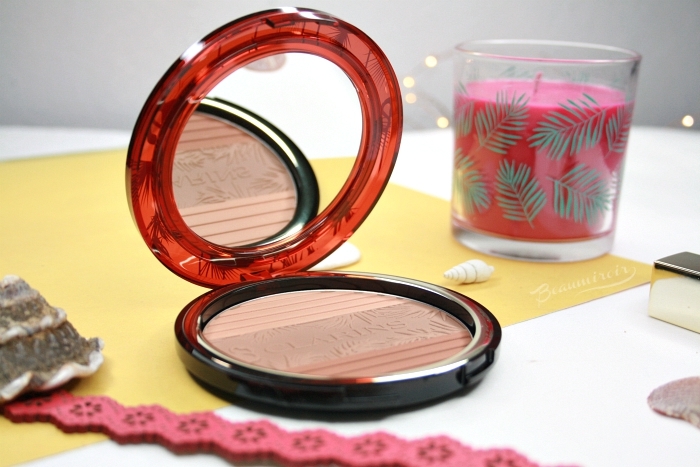 After Guerlain and Dior, today we'll focus on the newly launched Clarins Bronzing Compact. We'll talk flamingos, faking a tan with the swipe of a brush, and classic sunkissed looks. 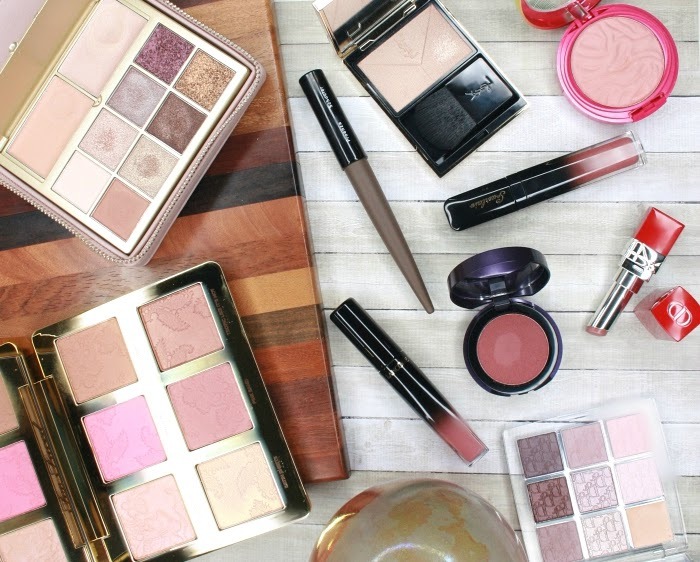 Keep reading for a splash of summer makeup! 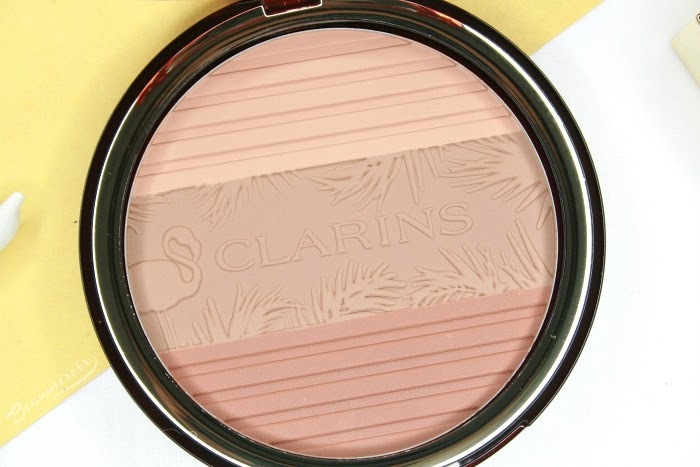 Clarins has been releasing limited edition summer bronzers for at least a couple of years now, but this is the first time I'm purchasing one. 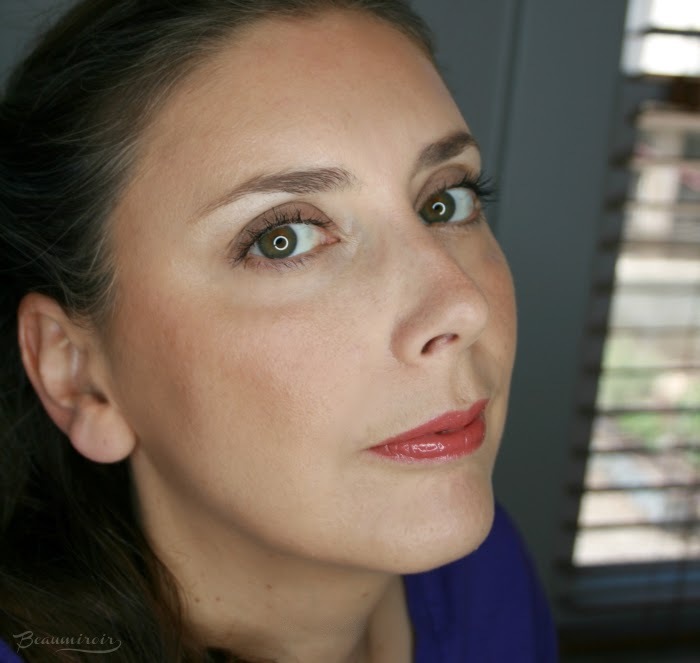 However I've been using the brand's makeup for about a quarter century (darn it makes me sound old! ): my very first high end eyeshadow duo and lipstick were a gift from my aunt Françoise when I was a teen, and they were both very wearable shades by Clarins. 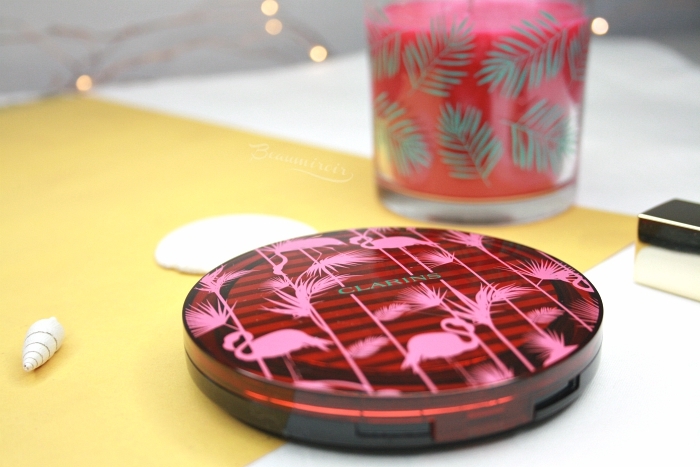 The main reason why I wanted to buy this Bronzing Compact, to be honest, is the packaging: the lid is decorated with pink flamingos and tropical plants contrasting with the brand logo in aqua green, all on a striped background. There is also a flamingo embossed in the powder together with a repeat of the fern pattern. I think it's very cute and summery! The compact is also very large, completely filling my hand when I hold it, and it contains a very generous 17 g of bronzing powder (compared to 10 g for both the Guerlain and Dior bronzers I reviewed in the past few weeks, but 18 g for some of the deluxe editions of Guerlain Terracotta like the Chic Tropic from last year). The bronzer is divided into three sections featuring three different shades: a light warm peach, a neutral medium brown, and a deep warm reddish brown. You can use each shade separately, swirl a brush all over the compact, or pick two shades to mix together. Each section is large enough to fit a regular sized blush brush. The idea is that this palette allows any skin tone to get the right color of bronzer by mixing the three base shades to match the intensity they need. I think it does work: there's enough contrast between the light peach and the deep reddish brown that a large variety of complexions can get a bronzer light enough or dark enough for their skin tone out of this compact. 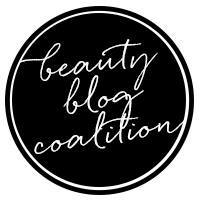 But if you're close to one end of the complexion spectrum, there will be a large portion of the palette that you likely won't use at all. When I mix all the shades of the Bronzing Compact together, I get a warm medium to deep brown with orange undertones. It's a little too dark for me, so I need to focus on the upper two shades and only add the bottom reddish brown to my mix very sparingly. 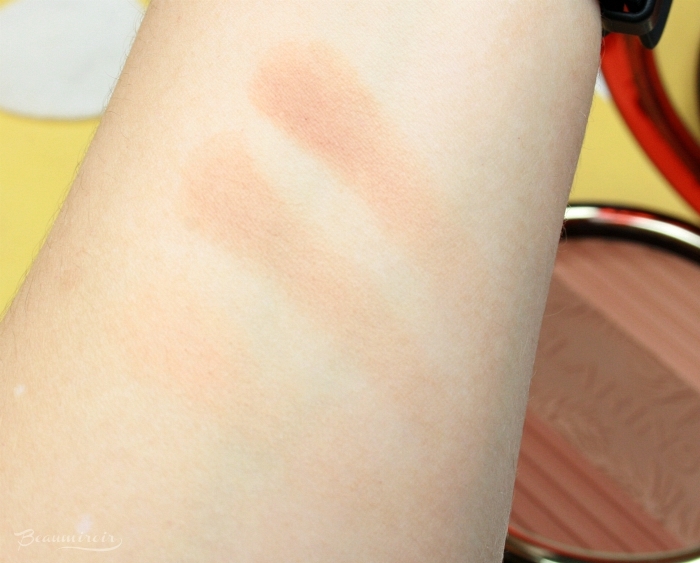 As usual it doesn't look extremely intense on swatches, but if I swirl my brush all over the powder I get a very visible faux tan on my cheeks in just one swipe! I think that medium to deep skin tones would love the pigmentation and depth of color you can achieve by using that bottom red-toned brown. 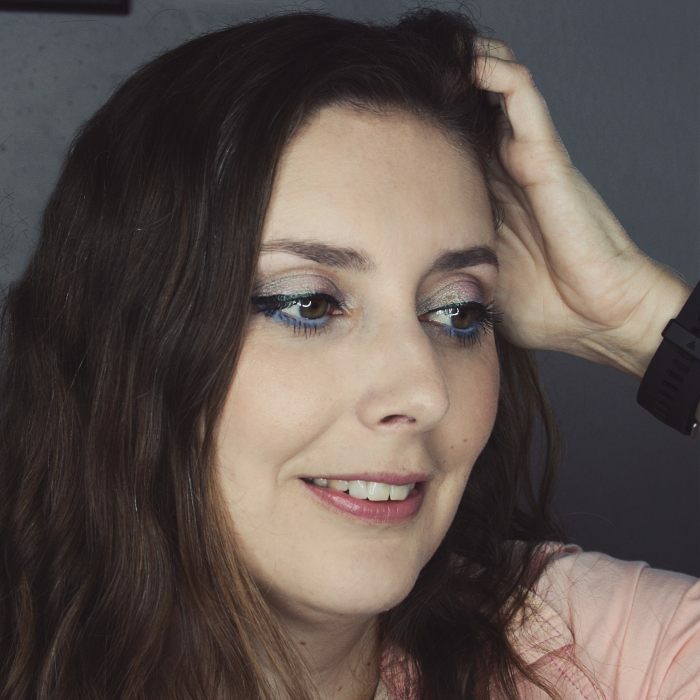 Overall this bronzer is on the very warm side: it's perfect for those who like to warm up their complexion for a sunkissed look, but those who avoid orange-toned bronzers should probably stay away. Again I need to apply it with a light hand and use more of the central, neutral shade to avoid looking like I binged on carrots. You know French beauty brands love to scent their makeup, and this one also has a noticeable summery fragrance. It is, however, much lighter than the scents of the bronzers both Guerlain and Dior released this year, and I don't really smell it during application. The texture of the Bronzing Compact feels incredibly soft and finely milled, so much so that it's almost creamy to the touch. It picks up very easily with a brush and delivers a nice amount of pigment to the skin, where it blends beautifully. If you look at the compact closely under a light you'll see some very fine golden micro-shimmer, but it does not translate as such on the skin. Once applied it has a natural matte finish - the kind of modern matte effect that I was mentioning in my review of Dior's bronzer. 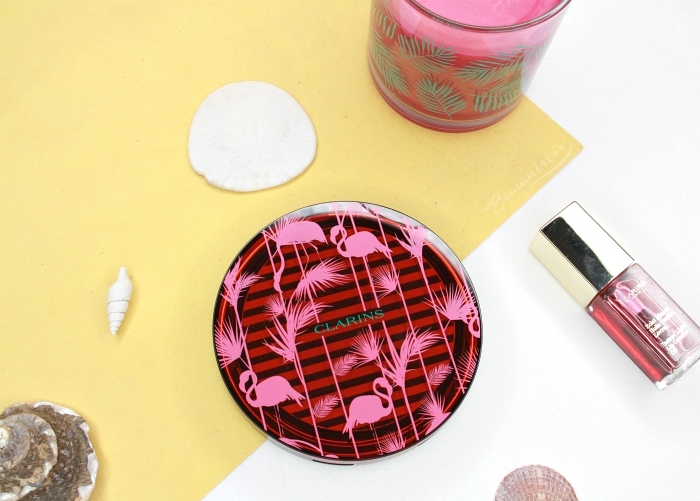 The Clarins Bronzing Compact is an adorable addition to my bronzer collection with its pink flamingos. I like the idea of a customizable bronzer with three shades that can be mixed to create the right color for a variety of skin tones. I think it might be a little too intense overall for very fair complexions and a little too warm for people with very cool skin tones. On the other hand, I think warm medium skin tones would probably find it very flattering! The product featured in this review was purchased by me. I received no compensation to write this post, which only reflects my personal opinion. This post contains affiliate links. I receive a very small commission when you click on those links, and the money generated covers a small portion of my expenses to purchase products for review. Clicking on those links helps ensure that Beaumiroir continues to publish reviews of new and exciting high end French products - at no cost to you!